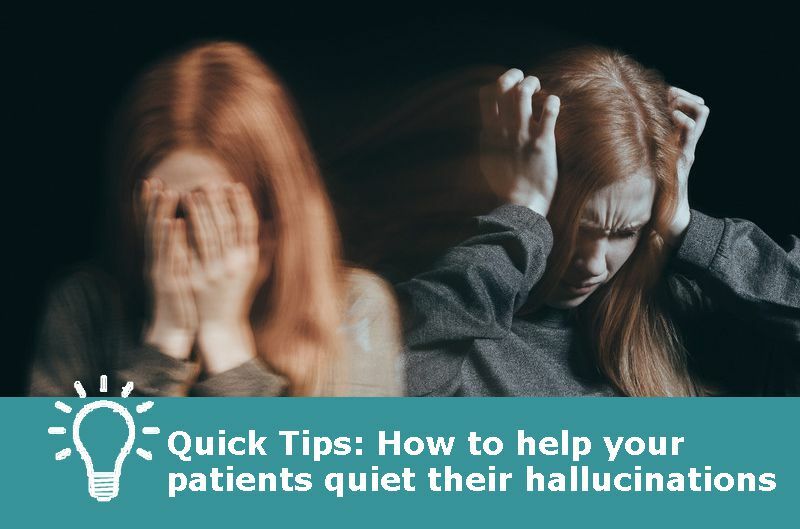 How can we help our psychotic patients cope with hallucinations that are still bothering them, despite adequate doses of antipsychotic medication? Here are some techniques to try (acknowledgments to Dr. Dost Ongur of McLean Hospital, who had discussed these in a past issue of The Carlat Psychiatry Report). Music. This sometimes helps, but other times aggravates hallucinations. Imagery. One patient imagined the voices going into a closet, and she saw herself putting a blanket over the voices, closing the door, then locking the door, then double and triple locking it, etc…. With each step the voices got softer and softer. Talking back to the voices. Dr. Ongur had a patient who was tortured by voices representing a struggle between good and evil. He asked her “What can you say to those voices that will help you cope with them?” She came up the following: “This battle doesn’t concern me, you figure this out amongst yourselves!” And she found this to be a very effective strategy to distance herself emotionally from the voices. Let me know if these are helpful in your practice and if you have any other techniques that you’ve found useful. Subscribers to The Carlat Psychiatry Report can read all the articles and interviews we’ve done with Dr. Ongur, including this Expert Q&A on The New Emphasis on Community Functioning in Schizophrenia. Subscribe here for access to all the searchable archives.